Hippih 20-piece Stainless Flatware Set,it is an integral part of the daily meal, with the proper thickness and weight for you to hold it comfortably, the checkered frost design makes the dining table more elegant. 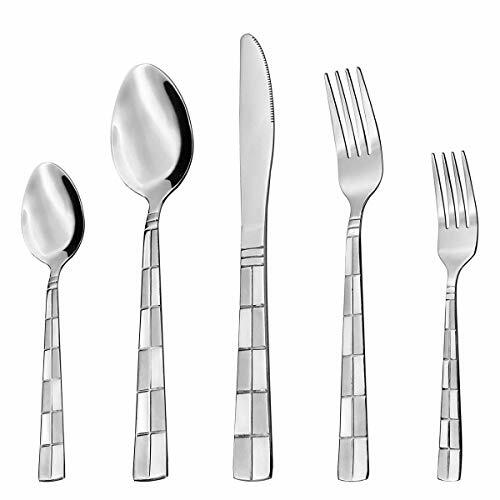 HIGH QUALITY - The Cutlery Set is forged from 18/10 stainless steel, the proper thickness and weight to stay comfortable. PERFECT GIFT - Utensil Set is the best choice for wedding, housewarming, camping, party and more. This Silverware is the best choice for wedding, housewarming, camping, party. Or a nice gift when you need extra cutlery sets.